The starting point is faith that the God, revealed in the Bible, is the creator of everything and that he is sovereign, intentional, and strategic. Therefore, all things find their genesis and fulfillment in him. Consequently, living strategically means to live aligned with God both individually and organizationally. One of the keys to living in alignment with God, is to live in accordance with his will and ways. To view a few excerpts from the training, please click above. This teaching is based on the Beyond Babel Model. organizations based on the timeless universal principles found in the Bible. This Model was introduced in the book Beyond Babel written by Dr. Gerald Chester, founder of Strategies@Work, LLC. Using the Beyond Babel Model, this teaching presents biblically based best practices for living strategically both individually and organizationally. Learning to live strategically is challenging. Everyone is plagued by the tyranny of the urgent, which leads to living impulsively. ﻿Living strategically is living with intentionality, that is, everything you do is designed to enable you to live in alignment with the will and ways of God. 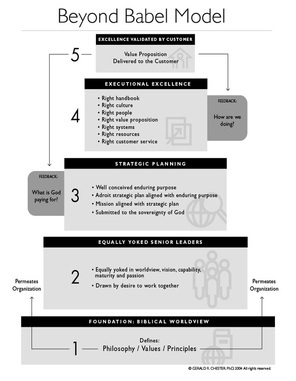 Strategic living is the process of discerning your God-ordained life purpose both individually and organizationally. And then aligning everything you do to accomplish this purpose in accordance with the ways of God. Strategic living is the only way that both individuals and organizations can realize their full potential. What do seminar participants say? "Unlike any learning experience I have ever had." "Dr. Chester was an extremely professional on-time wonderful presenter and even on hard topics his love for sharing this life changing information is very present." "Everything was presented well and backed with scripture." "Awesome! Love your heart to advance the Kingdom and to sow into us." "What impressed me the most was the importance of choosing to do 'right' rather than simply 'what works.'" "I learned that if people only focus on their own life, they cannot obtain clear vision; but when people focus on God, they can gain clarity on how they fit into the larger vision of God." "My take away is that I can only lead well when I discern God's will and have a Christian worldview to help me understand how to execute his will." "There were a lot of historical examples to help me clearly see how human beings are biased and how we can return to the right path." "I used to believe there is a gap between faith and reality. This is the first time I understood that God has plan and purpose for all industries." "I saw the importance of the four-step biblical process for aligning with God—seeing reality correctly, understanding reality correctly, drawing the right conclusions, making the right choices." "Through this training, I am clearer on my purpose in the context of history. A life plan can't be aimless. I have been too easily distracted by the things around me; in the end, nothing gets done. I learned the importance of being intentional about living aligned with the will of God." "Always good to continue to be reminded that our goal is to glorify God, and not ourselves." "Thank you for consistently delivering the message . . ."
"I live according to whatever attracts me. Mostly, I am busy all day but with no results. My biggest takeaway from this training is that no matter what attracts me, I must first consider the will of God." The fee includes the presentation, access to the recording of the presentation, an electronic copy of the presentation notes, as well as lunch, and refreshments.